Planetarium Zeroing in on the astrological planets - the heart of astrology. Weird and Wonderful of Astrology The mysterious, the odd, and the downright wacky of astrology. Back To The Basics Includes the Dr Z Crash Course and much more. Astrology, Archetypes, and Jung Astrology articles focusing on growth and maturation of the soul. Unus Mundus Section uniquely devoted to articles and tutorials on the depth psychology of CG Jung, signs, symbols, archetypes, and dream interpretation. The Deep A smattering of quasi-advanced astrological topics. Predictive astrology - peering into the future. Mercury Retrograde What is it and how do we best deal with it? Bookstore Astrology and soul growth titles featured. 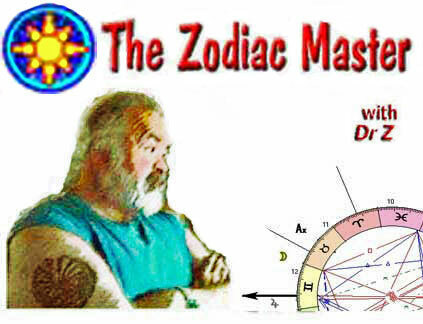 Start mastering the Zodiac at The Zodiac Master! Nope, you'll quickly discover that The Zodiac Master is not your typical, "bread and butter," and "run-of-the-mill" Sun Sign astrology site. First opened in September of 1996, the ancient symbolic language of Western Tropical astrology is still spoken, practiced, and taught at The Zodiac Master in 2017. So What's Really, Really Hot At StarryMart? StarryMart Help Center - Need help with an order you made? Smart Phone Users: Dr Z recommends Chrome or Mozilla Foxfire with their "mobile friendly options" when reading/viewing site articles with your Smart Phone.